Area : 656 - 1286 Sq.Ft. If you are willing to buy a home in Mumbai, have a look at Lodha Codename Big Win. The luxurious residential complex brings quality living to the homeowners. In case you are planning to move to a home with a good mix of luxury and comfort, you can buy an apartment in the residential complex. The commercial importance of Mumbai is high. As a result, the prices of these apartments are increasing. The residential complex comes with several sophisticated amenities for the residents. The estate is centrally located and the residents can get across to the important business zones in quick time from the complex. The important roads connecting the residential complex to the other regions include the Western Express Highway, New Link Road, JVLR, and JVLR. The residential complex is close to the airport and Film City. The upcoming Metro Line 6 will further strengthen the connectivity of the region. 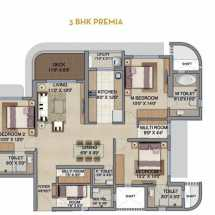 If you are willing to buy property in Jogeshwari West Mumbai, you can get an apartment in Lodha Codename Big Win.